Some of the most popular drought stories lately have been on the amount of what water needed to produce food from California, as a consumer sees it — a single almond, a head of lettuce or a glass of wine. The stories are often illustrated with pictures of common fruits, nuts and vegetables in one column and icons of gallon water jugs representing their water usage in the other. But there are more than two columns to this story. The amount of water applied to crops also translates into dollars and jobs — the main reasons for agriculture’s existence in California. 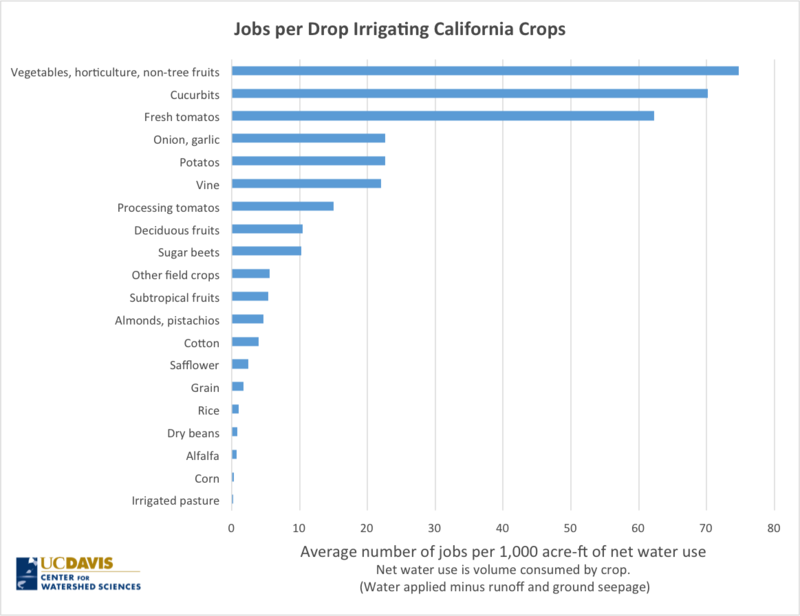 Here are multiple columns of data to better understand California’s crop water use and the revenues and jobs it is intended to produce. The charts below illustrate the data. A principal conclusion is that crops with the highest economic “pop per drop” — revenue per net unit of water — also usually have the highest employment per land area and water use. 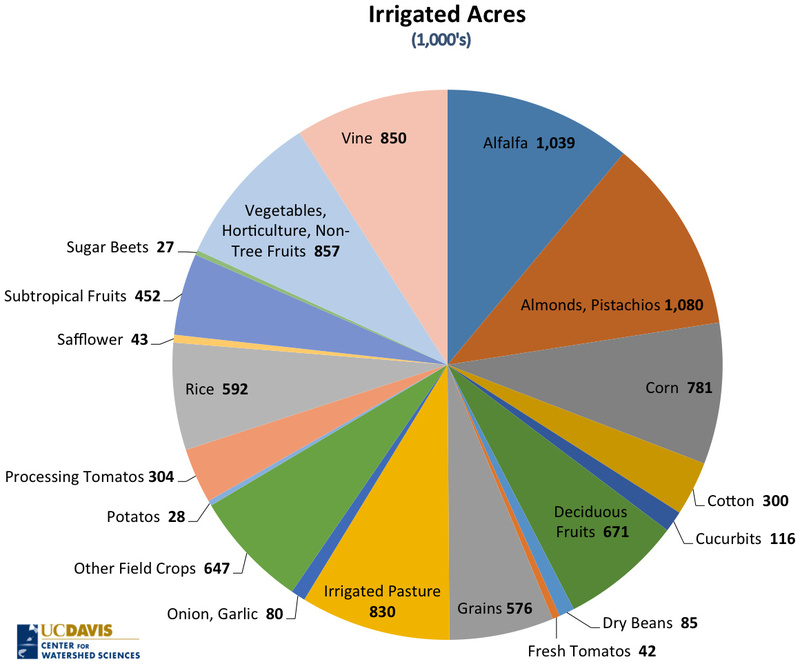 As a global food basket for fruits, vegetables and nuts, California’s net crop water use in 2010 was about 20 million acre-feet on 9.4 million acres of irrigated land. Gross revenues were about $36.7 billion. 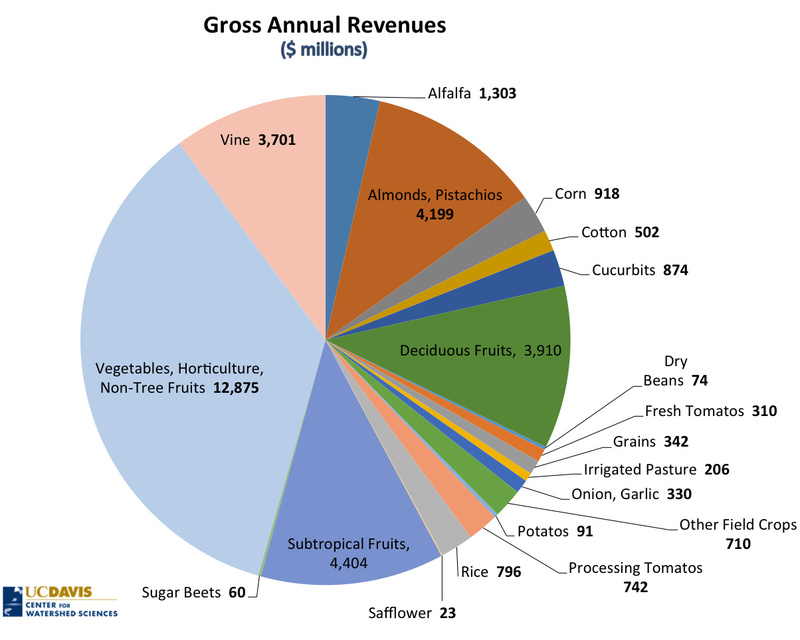 The top 5 crop group in revenue per unit of water use are grown on about 25 percent of California’s irrigated cropland and account for 16.4 percent of all the net water use. Those crops are responsible for two-thirds of all crop-related employment. Grains, livestock forage and other field crops rank lower in revenue and jobs per drop because the farming is highly mechanized, requiring relatively little labor. These crop groups nonetheless are critical to the livestock industry. California’s dairy production is the largest in the country. Vegetables, horticulture, fruits and nuts account for more than 90 percent of employment directly related to crop production. Farm contractors, who provide bulk labor for growers, supply about half the labor force for most crop groups. 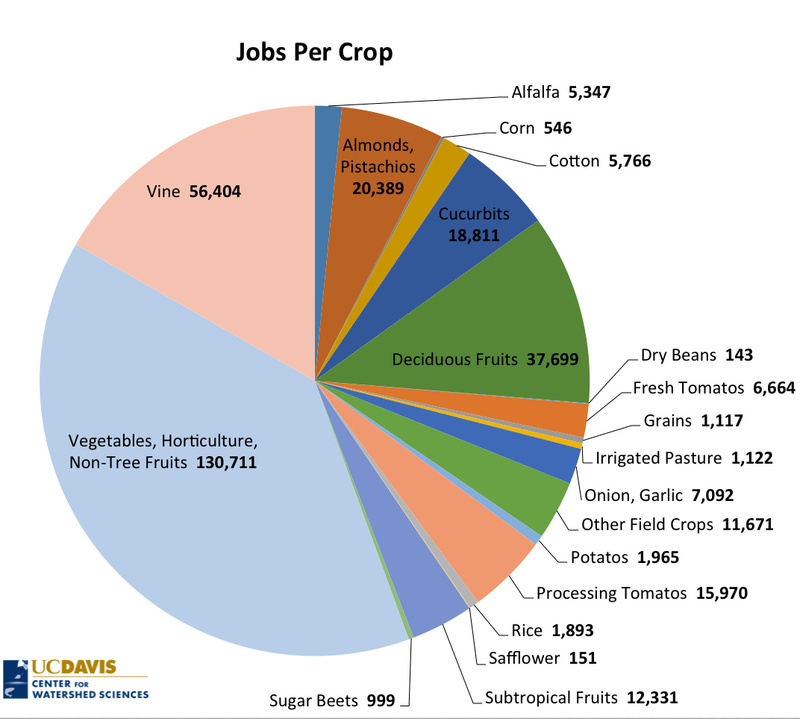 California agriculture accounts for about 400,000 full-time jobs (or their equivalent), including 172,000 in crop production, 29,000 in livestock and dairies and 193,000 in agricultural support services (contract labor). 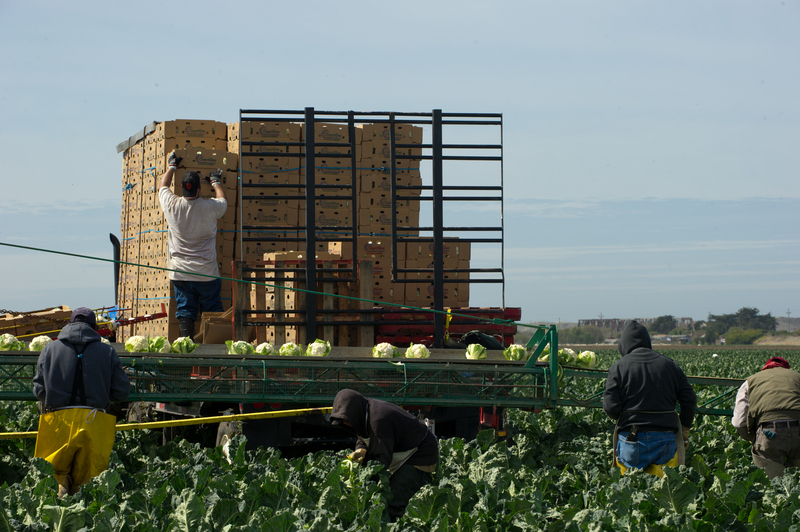 Some studies suggest that many California farm jobs are part-time, with an average of two jobs for each full-time equivalent job. California agriculture will use less water this year and in the long run. Several factors will lead to long-term reductions in farm water use in many areas of the state. Those include the state’s new groundwater legislation, ongoing salinization and urbanization of cropland, and increasing environmental water requirements. The drought has raised understanding of these inevitable reductions. But the growing market value of California’s specialty crops and growing yields per acre and per gallon will keep California agriculture healthy in most cases. Growing scarcity of water for agriculture is probably best managed using water markets and pricing so the industry and the state can make the most of limited supplies. Efforts to impose detailed arbitrary limits on crops and regions are unlikely to serve the economic and environmental interests of California, but rather distract from discussions needed for long-term progress. Josué Medellín-Azuara, Jay Lund and Richard Howitt are with the UC Davis Center for Watershed Sciences. Medellín-Azuara is a research scientist, Howitt is a professor emeritus of agricultural and resource economics, and Lund is a professor of civil and environmental engineering and director of the center. This entry was posted in Agriculture, Drought and tagged agriculture, drought, Jay Lund, jobs, Josué Medellín-Azuara, Richard Howitt. Bookmark the permalink. Jobs? What kind of jobs? At what wages? With what kind of benefits? For whom? Reblogged this on Vegan -Health and Hope. What is the price of a stream or river healthy enough to be fishable, swimable and enjoyable for its own intrinsic value? What is the value of water for residents, other businesses, and our environment, including other species, flora and fauna? How does the proposition to depend on water markets and pricing weigh in sorting out the Byzantine and dysfunctional water rights law and distribution systems we now have? In a water scarce environment (limited supplies, substantial demands), how does UCD’s Center for Watershed Science account for the non-fungible nature of water? The claim here that we should be [solely? predominantly?] using the economics of ag crops to describe the value of water in this state is, unfortunately, not the only game in town. Or in our state and the arid West. Unfortunately, even tho’ these authors know better, this particular column fails to even mention these other facets of the multiple crises we face. Using water markets and pricing will provide lots of water to the wealthy water users, but not account for all the other intrinsic values of water. We all have an interest in making sure that the water employed in the economy has the greatest economic contribution. Markets and prices are fairly effective at this. Inefficient water use just encourages folks to seek more water from the environment. Jay – Thanks for the reply. I agree that pricing signals within the marketplace are extremely important in promoting efficiency in water use. But we have seen that pricing for water, frequently for large, bulk users, is not priced at the true costs of water, given subsidies, political influence, tax advantages, crop insurance, and illegal and un-permitted water diversions throughout the state. Groundwater, including “connected groundwater”, is still out of the legal and pricing picture in any effective way, tho’ we’re finally beginning to see some movement towards public controls and regulation (even if it is coming way too late to save many groundwater basins and their connected surface flows). I fully expect to see major legal challenges to attempts by the state to assert some controls on groundwater regulation. The protections for public trust resources and for seasonal base flows of our rivers and streams sufficient to protect, sustain and restore our damaged natal fisheries are shot full of holes. Pricing signals as you’ve written about do not supply incentives to protect our public trust, without substantial, robust and enforced environmental standards. Whether it’s wine grapes or alfalfa, cotton or almonds, we’ve got a long way to go to get to a scientifically based, more rational system for use and distribution of our water – which is owned by the public – in this state. I believe, at this point, that nothing less than rewriting our state’s utterly dysfunctional water law will get us to a sustainable future. All the rest is tweaking around the edges. In the meantime, big ag is going to have to rethink and recalculate its use, demands and risk management, with pricing signals, regulations and new public policies. That being the case, would you be so kind as to give us your thoughts on this article? Douglas Deitch ED/Monterey Bay Conservancy, Santa Cruz, Ca. Can you please complete this analysis by sharing the amount of water used in the 29,000 “dairy and livestock” jobs that you mention? Thanks. 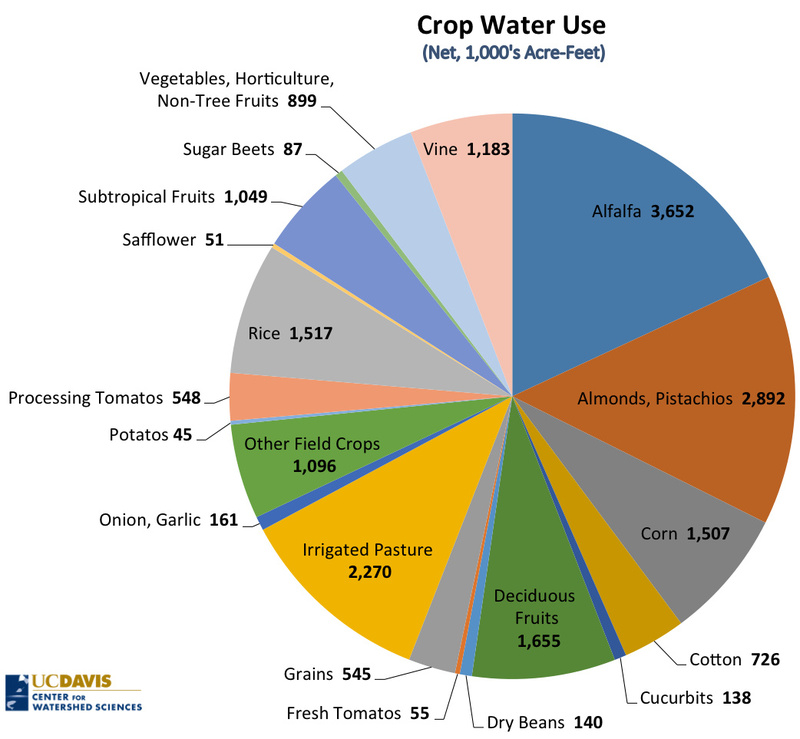 The largest chunk of water use in agriculture is crops, not livestock and dairies. Many crops serve as food for livestock and dairies. According to the USGS water use by state (and county) 2010 (see link below), livestock uses 211 TAF/yr (Crops use nearly 26,000 thousand in that report). It appears the pie charts have been sectioned in alphabetical order, you can increase the information those graphs provide by grouping crops by some sensible categorization. e.g “alfalfa” and “”irrigated pasture” should be beside each other (and corn as well), since they have the same primary use. I’m glad that nuts were separated from deciduous fruits. Perhaps just use the order used in the “jobs per crop” horizontal bar graph. Given this information is being presented in the context of the drought, I would imagine people would be most interested in understanding what (categories of) crops have the *least* “jobs per drop”. The animal feed slices are the amongst smallest, this obscures this information. I suggest only using the bar chart to present this information (remove the pie chart). Making a double bar chart (either two facets or double bars with two different y-axis) so the relationship between jobs per drop and a measure of total water usage for that crop (irrigated acres or acre feet) would be a good idea I think. Do you have data regarding the nature of the jobs credited to each sector (which are noted as full time equivalents), re: wage scale? Do you have data to show average or median wages in each sector, and whether they are meeting minimum wages for actual hours worked? living wages for regions of employment? are the wages calculated after the costs of any mandatory deductions from contractors (ie, housing, food, travel, etc)? That would be helpful in determining the overall value of the jobs attributed to California’s ag industry. thanks! David- yes. it is possible to obtain some information on earnings. a crude approximation: directly hired labor waters is about 5 billion per year in crops. Income paid to contract labor workers is about 6.7 billion. . Bottomline, just above 12 billion in wages for 400,000 ag jobs statewide (this includes livestock and dairies). If your numbers are correct, then some 400,000 ag jobs in the state are receiving an average of $30,000/year, or ~$15/hour based on fte. That seems rather high given the high proportion of migrant field and packing house labor. Needless to say, even if it is accurate, for the 200,000 jobs on the lower half of the bell curve, their jobs are hardly sufficient as a living wage in this state. We need to take into account supplements, in the form of state/government supplied housing, health and food subsidies. 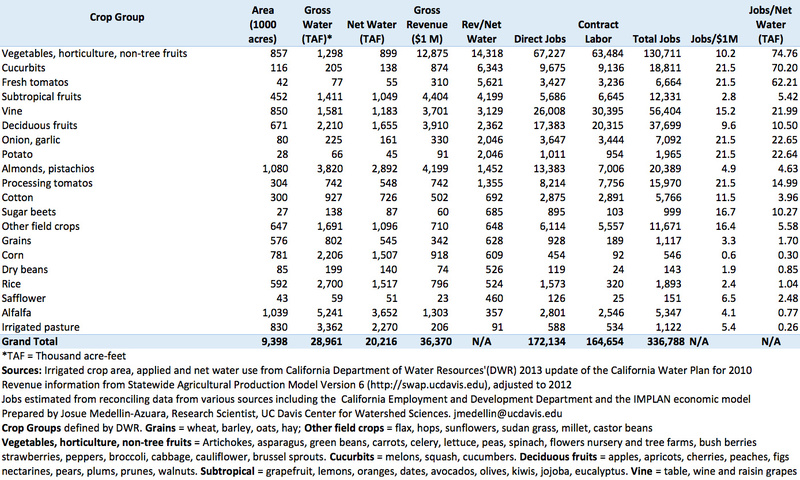 So, what is the actual value of the jobs apportioned to use in ag and the water it takes to get there? The “jobs per drop” accounting is a blunt instrument, but not that informative. Thanks for this good discussion. I understand your concern. This is the link for hourly earnings from CA-EDD. It points to $12.5/hour in 2012 below the back of the envelope (yet a great first cut) you made. we should take into account that for each FTE there are about 2 people with full employment. So yes, income in farm on a per capita basis can be very low. Mapping water consumption to jobs is an interesting statistic. A couple questions. If the water for that use is subsidized in any fashion, shouldn’t you adjust the number of jobs due to the water vs jobs due to subsidy? For instance, if a crop gets water for $50/acre foot when the consumer pays $2000/acre foot, that water has a $1950 subsidy (easy math version). So, the subsidy is responsible for what percent of the jobs? The water is responsible for what percent of the jobs? Also, have you ever calculated water-job output for non-ag use cases. For instance, water on my yard creates gardener jobs. I pay $400/month in jobs for water that cost me $2000/acre foot (no subsidy). Or, factories that require water certainly create jobs in that factory. Probably even more jobs/gallon since water is less of the total cost of goods sold. How many jobs does the 20% non-ag use of water create vs the number of jobs the 80% ag use create? After adjustments? Do you think the politicians and the University would be surprised where water is a more efficient creator of jobs? Where it might even create more total jobs? I’d like to see the graphs. The jobs per urban net water use would be an interesting statistic. There is a good argument to be made that few large ag subsidies remain current in California, mostly because those receiving cheap federal water some years ago have since sold their land and so then reaped the economic value of the subsidy in the market price of the land. Also, most federal crop subsidies don’t apply for most California crops. There are some subsidies (which appear to vary with the eye of the beholder), but probably much less than $ billions. After accounting for the differences in necessary value add (purification and delivery), why don’t you consider the differences in water rates between consumers and farmers a subsidy? If it’s not a subsidy, from purely an accounting perspective, where would you enter the difference on the ledger? To use water as a function of job creation, aren’t you essentially translating a commodity, gallons of water, into a type of “currency”? Seems the statistic needs to neutralize all preferences/advantages ag has on its water consumption (water rights, discounts, ground water access, unmetered wells, etc.) since a “job” is the common denominator used for your economic argument. Without that accounting, I don’t understand a cause and effect presentation.